Panoramio has reached 1 million registered users and over 5 million photos have been uploaded. 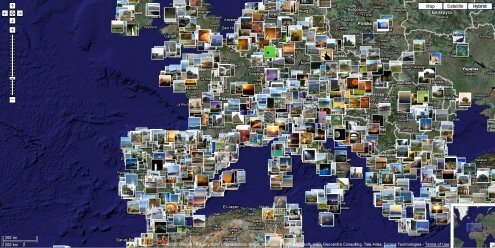 Of those photos approximately 80% were mapped and 2 million have been added to Google Earth (a number that increases monthly). The rise in the number of people using Panoramio and uploading photos since December 2006 has been incredible. People like very much to illustrate their favorite places and help correcting misplaced photos, we are very happy for that. We received some complains about the delay sending the photos to Google Earth. Unfortunately this delays will remain for some time. I believe that we should reduce the delay, but always has to be some delay. Arabic, Hebrew and Farsi languages are ready, but not online because we are preparing the interface to be fully adapted to right to left languages. Still some languages are not available. We are specially missing Hindi, Thai, Indonesian, Vietnamese and Tagalog. If anyone feels like helping with the translation to those languages, please, contact me at eduardo AT panoramio.com, I will appreciate it. The last weeks we had some issues with not appropriate ads displayed in the photo-pages. Some people reported that and we decided to remove them until we can assure those ads don't appear anymore. Sorry for any inconvenience caused. In the past adding more photos to the maps has always slowed down the performance. Now that is history. Check the new Panoramio mapplet, included as featured content in "My Maps" tab in Google Maps and you will see hundreds of thumbnails displayed simultaneously and smoothly updated while panning the map. Truly amazing!